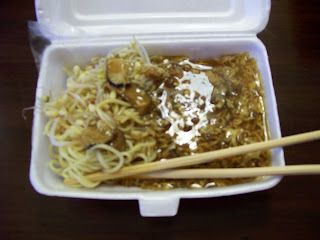 Lomie is one of Chinese cuisine, it is also known as Loh mee or Loo Mien. When I went to Semarang, base on my friend's reviews, I bought lomie in Semawis market Semarang. Like the other lomie as usual, this lomie contains of yellow noodles in thick brown broth that is contained mushroom, egg and chicken meat slices. After the noodles mixed with the thick broth, the taste of this lomie is delicious. Because I was not hungry, I bought this lomie for my lunch in a hotel. I just confused that I remembered how I could eat this food in a hotel, I have no bowl for the broth and spoon too. But the owners have prepared stereo form, plastics for broth, plastic spoons and chopsticks. For those who stay at the hotel and wanted to eat at the hotel as well, this is the right choice because there will be confusion about spoon and bowl anymore. The price of lomie is not expensive, just Rp.11.000 one portion.